In his memory, donations to Miramichi Shrine Club or Miramichi SPCA would be appreciated by the family. 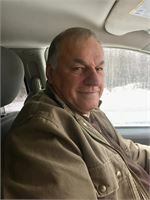 Joseph “Alfred” Alan St Pierre, husband of Ann Gould of Tweedie Brook Road, Kouchibouquac passed away suddenly on Sunday, April 7, 2019 at the age of 67. Born in Newcastle, NB, he was the son of the late Augustine and Leona (Martin) St Pierre. He was retired after 42 years from Local 95 Insulators and a member of the Roman Catholic Church. Besides his wife, he is survived by his daughters, Vanessa St Pierre of Ontario, Amanda St Pierre of Ontario and Tiffany St Pierre of Ontario, his sisters; Gina Hachey of Caraquet, Freda Cain (Denis) of Miramichi and Yvonne McCleary of Miramichi, his brothers; Yvon (Nadine) of Miramichi and Angus (Jeanine) of St Margaret’s and his 10 grandchildren, Devine, Kaylee, Kenneth, Jasmin,Justice, Jaden, Paige, Samantha, Kamryn and Kyler, great grandson Edan Rumbolt-St Pierre. He was predeceased by his parents and sisters Rita, Alice and Mary Ann. At the request of the family there will be no visitation. The Funeral Service will be held on Saturday, April 13, 2019 at 11 am at Davidson’s Funeral Home Chapel with Father Paul LeBlanc officiating.